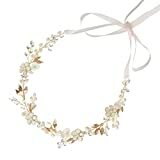 1.Brilliant Bohemian bridal hair vine sparkling with dozens of oval crystals, round pearls and small enamel flowers. A very flexible piece that could be worn as a headband or woven into your wedding hair style. Great and easy for you to DIY your hair style. 3. Each end has a loop and comes with pearl pink satin ribbon. This entry was posted in Wedding Store and tagged Accessories, Band, Bohemian, Bridal, Freshwater, Gold, Hair, Headband, Light, Pearl, SWEETV, Vine by Formal Affair. Bookmark the permalink.